James Chronister, Dana Hemenway, Kira Dominguez Hultgren, and Paul Wackers will exhibit works for this show. The exhibit began loosely conceived around the color blue. As I considered quotes and ideas about the color blue, a quote by Lord Byron, “O! ‘darkly, deeply, beautifully blue,’ As some one somewhere sings about the sky”, surfaced and I found it to be enchanting and romantic. This became funny as the levity of the quote turns out to be a satirical jab at one of Byron’s contemporaries. Another title I considered was “Last Blue Before Black”. This is the title of an album by “Id Battery”, an obscure drone and found sound band from the late 90s. The title “Last Blue Before Black” has come back to me many times over the years as the penumbral concept and visual calls to mind a nuanced fading. The title concisely describes the complex perception of a color shifting. “The Last Blue Before Black” reads as a suggestion of nightfall, or as something as sinister as a bruise ending in unconsciousness or our visual field fading to only the absence of color. And that it’s a title for a collection of sound – an album of disconsonant compositions and atmospheric recordings beckons the pleasure and distraction of synesthesia. Visual and aural art so often is a kind of reverse synesthesia, a color points to an emotion creating some of kind of resonance with a memory we have. I decided to title the show with the more buoyant description of blue, than the blacker one. However, “The Last Blue Before Black” also permeates the works in the show. As luck would have it, when I asked Kira Dominguez Hultgren to exhibit her works it turned out that she had studied Byron’s epic poems and written her thesis on the topic while she was attending Princeton. (If you know Kira, this is less of a surprise than one might think). In what is such a wonderful piece of chance, Kira knows the poem intimately and knew that the seductive and romantic description of blue is actually a reference to a line by the poet Southey. The artists in this show have all included works that are blue or the “last blue before black”. James Chronister’s painting “Procession” uses the deepest blue to make what we perceive as black. Chronister’s body of work plays with our perception of understanding an image. His use of small brush strokes to make up a painting sourced from a photographic image creates a true-to-life feel from far away and falls apart into abstraction when looked at closely. Procession toys with our perception of color and also of image. Kira Dominguez Hultgren includes two pieces. One, “Across: Fleeced” is a commentary on the “Blue Lives Matter” countermovement. “Blue Lives Matter” is an organization that provides “a Police Officer’s family with comfort and support as they go through hard times.” While the aim of the organization is charitable and well-meaning, naming it so closely to the “Black Lives Matter” movement has brought intense criticism from many. “Across: Fleeced” references and problematizes the organization. It is mostly black and includes chains, leather strands and symbols of police badges and guns. The piece reads as a criticism. By naming “Blue Lives Matter” so closely to “Black Lives Matter” the movement has been perceived as a rebuke to the campaign against violence and systemic racism towards black people. The chains woven into the fabric clearly bring to mind images of incarceration and slavery and conflate the two movements into one piece. Dominguez Hultgren’s other piece, “Bridge: We/They”, plays with binary ideas. The black and white of checkerboard, the “we” and “they” and also the two panels connected together in the middle suggest opposition. Kira describes it this way: “the imagery in part is based on a tally sheet for the card game Bridge. This game is played in pairs who sit opposite one another. Cards act to bridge the players who are organized into teams of we or they. The line drawn down the middle of the tally sheet marks this division”. Dana Hemenway includes “Untitled (Perfect Lovers)”, a luminous and entwined sculpture connected on the top and the bottom, but with each strand remaining individual. Like Byron’s poem, Hemenway’s piece points to a tryst with a paramour where the perfect connection is one where you can be entangled but remain separate. Paul Wackers includes two paintings, “Vibrations Before Dawn’s Light” and “Shy Youth and the Way Ahead, Get Out of the Way”. Wackers’ work is always about color and his incredible handling of paint in multiple methods. Impasto areas collide with carefully blended hues of deep midnight and black across the upper left corner of “Vibrations Before Dawn’s Light”, while thin sprayed pastels and saturated bands of thick paint make up the objects arranged in the foreground. “Shy Youth and the Way Ahead, Get Out of the Way” is unabashedly exuberant, delighting in the charms of well-mixed color and eschewing muddiness. Read on as Kira Dominguez Hultgren brings her insights to the quote “O! “darkly, deeply, beautifully blue,” As some one somewhere sings about the sky”. “Lest we think this stanza is an exhortation toward pastoral contemplation, Lord Byron (1788-1824) is anything but earnest in his epic satire Don Juan (1818-1824), pronounced Joo-an. No, everything in this poem is fair game for Byron’s biting derision, especially England’s Poet Laureate, Robert Southey (1774-1843), to whom Don Juan is dedicated. Southey is the “some one somewhere” so enamored with his own fame and privileged position as the poet of the British crown that all he can see from his lofty towers is the sky. Byron lifts Southey’s lines “darkly, deeply, beautifully blue,” from Southey’s poem, Madoc in Wales (1805), to mock this poet and his capitulation to moral and political conservatism. In contrast, Byron and his Satanic poems, as his verses came to be known, does not look to the sky, but allows Southey’s blue to direct his gaze downward. In these verses, Byron, like his character Don Juan, fixates on the body, preferably the denuded body. Byron writes of the nobility’s blue stockings and garters discarded between the hours of midnight and morning, when he a “rhyming lover” can examine “few pair of that hue” (110-111). Blue as a visible trapping of the nobility becomes a pretense in Byron’s hands. Instead, he discloses that “learned ladies” are not so confined by the blue of their stockings, as to keep Byron from “read[ing]” them as they “read” him (110-111). But it is not just the ladies! James Chronister (b. 1978) earned his MFA in 2004 from the California College of the Arts in San Francisco where he received the Richard K Price Painting Award. In 2010 Chronister was nominated for the SECA Award by the San Francisco Museum of Modern Art. In 2013 he was awarded the Artist-In-Residence at the Lux Art Institute which was accompanied by a survey of his work from the years 2009-2013. 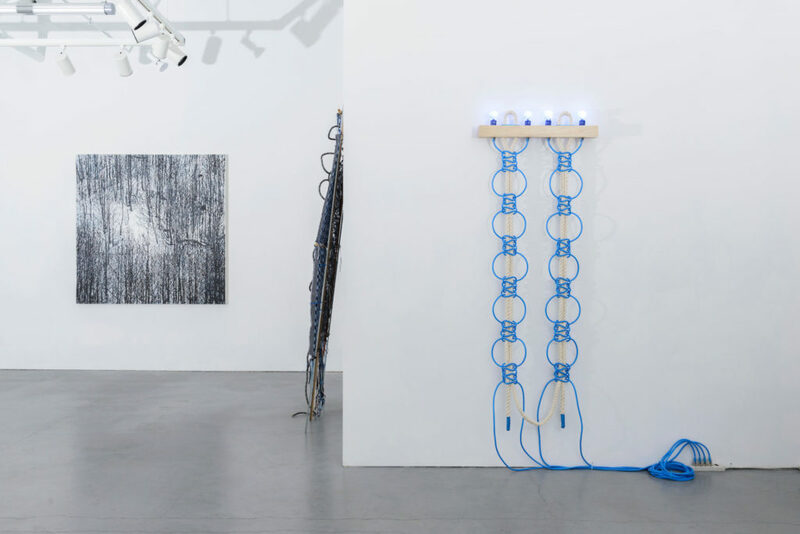 Chronister has exhibited work in solo shows, group shows and art fairs in New York, Los Angeles, Miami, San Francisco, and Minneapolis. His paintings have ranged in style from near photorealistic to large-scale abstraction. Currently a Charter Artist in the Minnesota Street Projects Artist Studio Program, Chronister lives in San Francisco, California. Dana Hemenway is an artist based in San Francisco. She received her MFA from Mills College and her BA from University of California Santa Cruz. She has had residencies at the Bemis Center for Contemporary Art (Omaha, NE), SÍM (Reykjavik, Iceland), The Wassaic Project (Upstate New York), Root Division (San Francisco, CA), and is a charter resident of the Minnesota Street Project’s Studio Program (San Francisco, CA). Dana is the recipient of The San Francisco Arts Commission Individual Artist Grant, a Southern Exposure Alternative Exposure Grant, and in 2017 she was awarded her first Permanent Public Art Commission for SFO’s Terminal 1, which is scheduled for completion in late 2019. Dana has exhibited her artwork locally, nationally, and internationally including: Sophis Gallery in Seoul, Proyectos Monclova in Mexico City; Aquarius in Brooklyn, NY; Wave Pool in Cincinnati, Ohio; The Santa Cruz Museum of Art and History in Santa Cruz, CA; Eleanor Harwood Gallery, The Popular Workshop, San Francisco Arts Commission Gallery, SOMArts Cultural Center, Park Life, Southern Exposure, & Intersection for the Arts in San Francisco; Pacific Film Archive in Berkeley; Palo Alto Art Center in Palo Alto; EXO Project Space in Oak Lawn, IL; and Statler-Waldorf Gallery in Los Angeles. From 2015 – 2017, Dana served as a co-director of Royal Nonesuch Gallery, an artist-run project space in Oakland, CA. She is represented by Eleanor Harwood Gallery in San Francisco, CA. Paul Wackers was born New Haven, Connecticut in 1978. He received his MFA from San Francisco Art Institute, and BFA from Corcoran College of Art and Design in Washington, D.C. Some of Paul’s solo exhibitions include Narwhal Projects (Toronto, ON), Alice Gallery (Brussels, Belgium), Eleanor Harwood Gallery (San Francisco, CA) and Morgan Lehman Gallery (New York, NY). Paul has also been in several group and two-person shows, including exhibitions at New Image Art (Los Angeles, CA), Halsey McKay (East Hampton, NY), Frosch and Portmann (New York, NY), and Headlands Center for the Arts (Sausalito, CA). His work is in the MIMA Museum (Brussels, BE) and many prominent private and public collections, including Chevron Corporation, Fidelity Investments and the Ellie Mae Corporate Collection. He also installed a large public mural on the James Hotel in New York City. He received the Tournesol Painting Prize in 2008 with an awarded residency at the Headlands Center for the Arts (Marin County, CA), the NKDale Residency (Sunfjord, Norway), Encore (Brussels, BE), and an artist residency at the Byrdcliffe Colony (Woodstock, NY), and the Watershed Center for Ceramic Arts, (Portland, ME). Paul Wackers has been exhibiting with Eleanor Harwood Gallery since 2006. He lives and work in New York City. Eleanor Harwood Gallery opened September 2006. The programming of the gallery focuses on emerging to mid-career artists exhibiting nationally and internationally. The roster includes artists that are represented in major American and European collections. The gallery actively promotes and encourages career growth for represented artists.